Singapore Changi Airport is the busiest airport in Asia, serving hundreds of international flights a day. 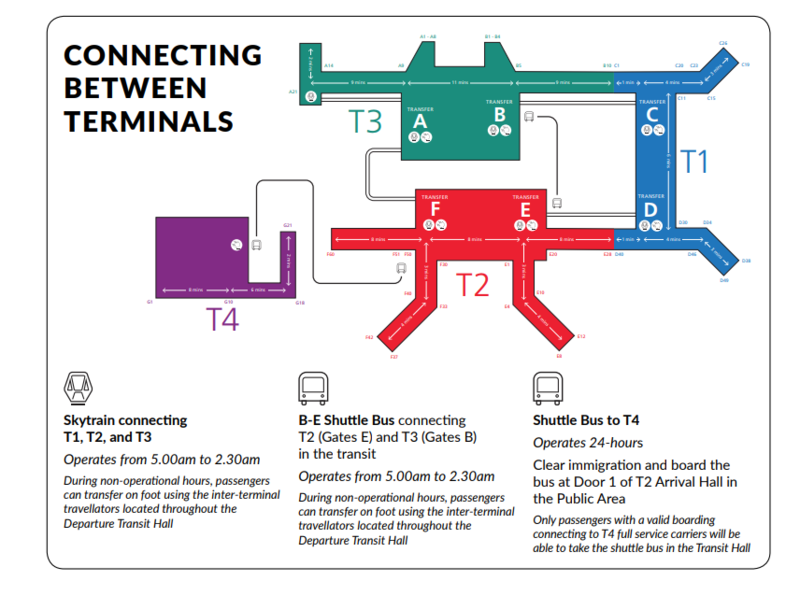 The airport provides multiple transit options into the city, all accessible directly from the majority of terminals at Changi and all at reasonable prices, operating for all hours of the day and night. Changi airport taxis are available 24/7 and will take you in to the city in approximately 23 minutes for around 15€ (S$25) - note that this price is affected by a variety of factors. Alternatively, there are two methods of public transport, by metro (MRT) or bus. The MRT will take you into the city for 1.20€ (S$2), or 1.08€ (S$1.75) with an EZ-Link card and take around 30 minutes. A bus, being the slowest option, will take around 1.5hrs and cost around 1.50€ (S$2.50) or 1.18€ (S$1.84) with an EZ-Link card. The MRT is a quick way to get around Singapore city, provides regular departures and is a relatively inexpensive method of transport. There is no direct line on the MRT into the city centre, so the route requires a change at Tanah Merah Station - which links to the airport - onto the 'green line' train heading Westbound to get to the city - check which stop is the closest to your hotel. The journey takes approximately 30 minutes by this method. Note the peak hours of the metro apply between 08:00am-09:00am, 12:30pm-02:00pm and 07:30pm - 10:15pm every day. 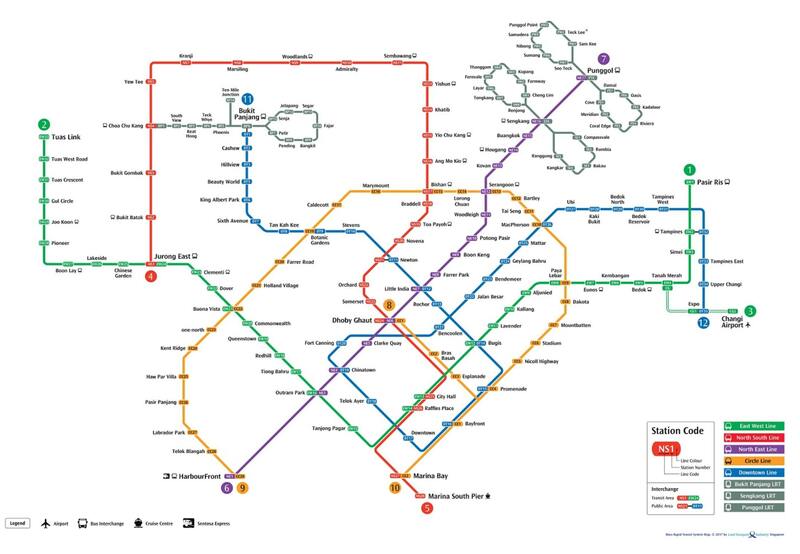 How much is the metro from Singapore Airport to city centre? The metro is a cheap and relatively quick option to get into the city, however the peak hours can make the train very busy and the changeover can be a hassle. You should consider other options if you have lots of luggage with you. The EZ- Link card can be purchased or topped up in multiple locations around Singapore, such as SingPost stores and 7/11 Stores around the city. EZ Link cards are purchasable in $S5, S$10, S$12 - however remember that the cost of the card is S$5. You will need to scan out and in each time you leave a metro station - and your fare will be discounted based on the distance traveled. Taking the metro is a good way to avoid tolls in effect in the CBD. A Changi airport taxi provides the quickest and most comfortable way to travel to the city centre of Singapore. Taxis are very reliable, under legislation and metered. They will appear in many colours in the rank as they are operated by many different companies within Singapore. The journey will take you around 23 minutes, in usual traffic. The taxis in Singapore are metered and a number of factors will contribute to the cost of your journey. Under standard conditions the journey into the centre should cost around 15€ (S$25). Taxis provide a quick, efficient and safe journey into the city with minimal hassle. There may be a queue for the taxi at the rank however, and depending on the travel time and day, you may find this can be an expensive journey. Ensure to check the additional fares before you travel. There are taxis available all over Singapore; you can flag them down or use one of the many apps available to order one when you're out and about. It is best to have cash with you to pay for the taxi, as using a credit card will incur a 10% surcharge. If you are at all unsure, you can ask the driver how much your journey is likely to cost in advance. You can always ask for a receipt at the end of the journey in a taxi for breakdown of costs, this is standard procedure for taxis. Taking the bus into Singapore Central is the slowest method of transport, however is also a cheaper option than a taxi. The public bus from the airport is the 36/36A which runs from the airport to the central MRT stations in the CBD - Marine Parade Rd, Somerset or Orchard Rd. Taking the bus to the CBD will take approximately 1.5 hours, yet it does make a lot of convenient stops but you may also need to walk depending on the location of your hotel - the bus makes many stops at MRT stations. Note: There is a shuttle bus service that also runs from the airport, but it is more expensive at 5.60€ (S$9pp), and is best for light luggage and solo travelers. It will do drop offs to major hotels, and is 24 hours - leaving every 15 minutes in peak hours or 30 minutes otherwise. It will take approximately 25 minutes to reach the centre and tickets can be purchased from the Ground Transport Desk at the arrivals. How much is the bus from Singapore Airport to city centre? Although the bus is a cheap option and has many good stops in the city, it is a slow journey and during peak hours can be very crowded - especially with luggage. Most of the stops for the bus are at MRT stations in the city, which can mean a walk - troublesome for those with luggage. The bus runs fairly regularly in peak hours, so if you can't fit on one - just wait ten minutes for the next. The bus has the advantage over the metro of being available from all terminals. If you need to take a bus then a metro, or a metro and then a bus, it is best to get an EZ-Link card so that you can get a discount on multiple methods of transport. How much is a taxi from Singapore Airport to the city centre? Taxis in Singapore are metered and there are a number of factors that influence the price of a taxi journey, therefore there will be a discrepancies on any prices dependent on day and time. However, under basic circumstances a taxi should cost around 15€ (S$25). How many transfer options are there from Singapore Airport to the city centre? There are three different transfer options - by taxi, bus and MRT (metro). All three options are available from most of the terminals at the airport. How far is Singapore Airport from the centre city? Singapore Changi Airport is located 24km from the centre of the city. The journey should take around 23 minutes by taxi.